Latest News: Allahabad HC Group C & D 2016-17 District allotted list is available on the official website of High Court of Judicature at Allahabad. Appeared candidates can check their name and date of birth in this list. Link is available in below given table. On 13th January 2019, the High Court of Judicature at Allahabad has successfully called candidates to attend the Allahabad HC HJS Pre-examination. The Allahabad High Court HJS Admit Card 2019 was available from 9th Jan 2019. Almost every candidate who has applied has participated in the written examination. After attending the Allahabad HC HJS Pre-Examination, they are humbly waiting for their result. Here is news for them. Allahabad HC HJS Pre Result is declared by the High Court of Judicature at Allahabad. Candidates can check it from www.testhill.com. We are going to provide the direct link to Check Allahabad HC HJS Pre Result 2019. Short Info: The High Court of Judicature at Allahabad has successfully conducted the Stage II Examination. There are a total of 1955 vacancies for this Personal Assistant, Clerk, Peon, IT Supporting Staff post. Numerous candidates have appeared in this examination. Now, they all are humbly waiting for the Allahabad High Court Result. Here is good news for them. The authority has announced the Allahabad High Court Result 2018. Appeared aspirants are able now to check their result. They have to visit the official website at allahabadhighcourt.in with regard to checking the Result. 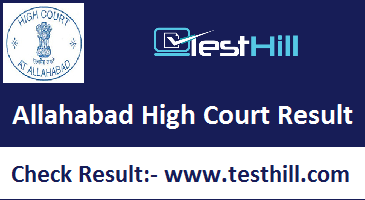 Allahabad High Court Result 2018 is available on the official website of Allahabad High Court. Candidates can check it now. All the appeared candidates are waiting for their result. There were 1955 vacancies in this recruitment and a huge number of candidates have participated in the examination. This result is very important for each candidate who has appeared in the written examination. The applicants who have qualified the written examination will able to grab this job. So, the authority has declared the result for Allahabad High Court Stage II examination 2018. From this result, candidates can check their roll number. They need to go to the official website to check Stage II result 2018.